What you'll need: A manila folder, clip board, thumb tack , masking tape, short ruler, colored pencils or hi-liters. 1. Push the thumb tack though the top of the manila folder from the inside out. Tape it. You can work directly on the manila folder or use an intervening piece of paper. A clipboard or piece of tape will secure the paper in place. 2. Push thumbtack through center of dial (at cross hairs) and reinforce with tape. 3. Mark 0 deg Aries at top of your work surface in the 12 o'clock position. Draw a line bisecting the dial to the 15 fixed deg. Position. Proceeding counterclockwise, mark 0 deg Taurus at 30 deg and 0 deg Gemini at 60 deg. You may want to draw a triangle connecting the 0 Aries/ 0 Tau/ 0 Gem positions. –You may also want to draw a cross bar from the center of the dial at right angles to the pointer. This marks the 22 1/2 deg. Position. 4. Enter all cardinal planets in the first 30 degrees, starting at the top and proceeding counterclockwise down the left hand side. Enter all fixed planets across the bottom, left to right, starting at the 0 deg Taurus position. Enter all mutable planets up the right side, bottom to top, starting at the 0 deg Gemini position. 5. All 4th harmonic positions (conjunction, square, and opposition) will be in the same place. All 8th harmonic (semisquare and sesquiquadrate) will be directly opposite at the bottom of the pointer. All 16th harmonic (22.5, deg bioctile) will be at the stem of a "T cross" capped by the pointer. If your pointer is contacting a planet, any other planets in the same place are either conjunct, square or opposed. Any planet on the other end of the pointer is semisquare or sesquiquadrate, any planets on the "T" are bioctile. 6. All 3rd (120 deg), 6th (60 deg) and 12th (30) harmonics are shown by the 30 deg 0 Aries-0 Taurus-0 Gemini separations. Wherever the pointer rests, trines and semi-sextiles will be at the 0 marker, and sextiles will be at the 60 deg 0 Gemini marker. –You may wish to mark the 15 deg midpoint of the 30 deg segments on the dial. 1. 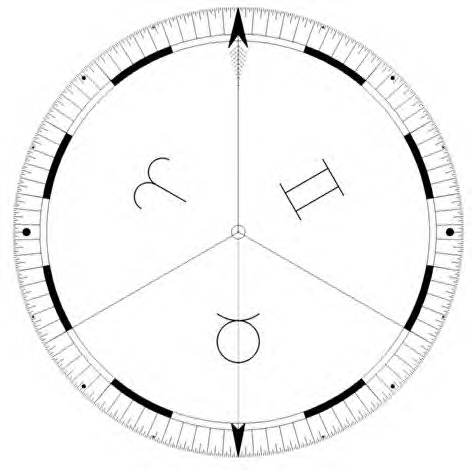 Enter all cardinal planets/positions from top down to the left, starting at the 0 Aries position. Enter all fixed right to left across the bottom starting at the 0 deg Taurus marker, enter all mutable from bottom to top to the right starting at the 0 Gemini marker. 1 mo = 05' 03"
1 day = 00' 11.17"
3. Mark the directed solar arc position on both the work surface and dial (use a piece of tape). Mark it both direct and reverse. As the dial rotates you will be able to see if the S.A. directed planet/position/ midpoint is contacting natal planets or transits. 4. Any number of charts can be entered and compared at the same time. All that's necessary is some method of separating them. Try hi-liters or concentric circles drawn with a compass. You will always be using at least a natal chart and transits. 5. It's good practice to use a ruler to extend a line from the center of the dial outward to the perimeter, to mark each planet's position. A small transparent ruler leveraged against the thumbtack point works nicely. This is particularly necessary when using concentric circles to separate charts. You're ready to analyze a chart. The easiest method is to simply rotate the pointer to each planet/point in turn and record your findings in a "tree". Remember to include the 0 Aries point. It is an indicator of our connection with the world and "times" as marked in the yearly solar/earth cycle of solstice and equinox. Example: Put pointer on natal Sun. The notation convention is natal (n), transit (t) and directed (d+year) i.e., (d98). You might prefer to use à to indicate a direction. I recommend using slanted lines for 15, 30, 60 deg. Separations and indicating a break on the tree before noting midpoint-only configurations. Semisquares are always at the bottom of the pointer. (n) Sun (t)Saturn (d98) Pluto Natal Sun is being either conjoined, squared oropposed by Saturn with accompanying Pluto direction. (n) Venus Natal Venus is semisquare Sun. The tree should reflect what you see as you look at the dial. I know the transit moon aspect is a sextile because it is to my right. If it were left, it would be either a semisextile or a trine. I also feel free to improvise brackets and other devices to show special connections that seem important as the need may occur. The purpose is to record all the elements, natal, transit and directed, that are operating at a given time on a given axis; and hopefully to be able to read your notes a few years later.. I recommend using a hi-liter to mark the natal configuration. In the case above, natal Sun = Mer/Saturn/ Venus. This is the potential configuration that is being activated (and limited) by the year-long direction and quicker moving transits. As you've already noticed, using a 90 allows you to easily see half, quarter and even eighths of a degree. You are only limited by the thickness of your pencil lead in dial notation accuracy. We seldom use more than a degree and a half orb, and you will find that the number of heretofore unexpected semisquares and midpoints would make using larger orbs overload. First simply look at all the connections you've never noticed before. Then break them down into logical complexes. Sun and moon should relate to father and mother, body and soul. Mars and Saturn should be (and is) frustration, while Mars and Venus should be attraction. A little logic will tell us that Uranus and Mercury should be stimulating while Uranus and Mars might be accident prone. Work your way through your chart noticing what planets group with others. The whole idea behind this method of work is the notion that tightly linked planets work together. Lesser harmonics buy into the effect of the larger and combine their influences so that when one part of the pattern is activated, the whole gestalt rings like a bell. Two of the best know "cookbooks" are Rienhold Ebertin's Combination of Stellar Influences (available from AFA) and Alfred Witte's Rules for Planetary Pictures. I recommend using one, especially Ebertin's if you aren't familiar with the Uranian hypotheticals. It's more comprehensive anyway. This is how Ebertin's CSI would interpret the tree given above. Principles: Sun/Venus — love, harmony, art, ideals. A love object or an artist. = Saturn, inhibition, separation from the lover, difficulty in expression. Mercury/ Saturn — both depth of thought, thoroughness, concentration, and "the state of enduring and suffering without yielding. Hard times in infancy and adolescence, with frequent estrangements and isolation"– from CSI. = Sun , retarded development. Repeated moves. = Venus, instability in love relationships. Separation in love. Transit Saturn to (n) Sun. These are coming of age, developmental transits. It would resonate with the inhibition and difficulty of expresssion. This problem would be paramount in the person's life now! Saturn/Pluto — Hard labor, cruelty, violence, application of force or compulsion. · The directed Sun says this is the year, the transit Moon says this is the hour. This is from the chart of a young man who abducted and raped a young woman, and then committed suicide. The police found photographs of her in his rooms; he may have stalked her. She didn't know him personally (according to news reports), but both were art students at the same college. He was from a military family (frequent moves). The natal chart is untimed, but transit moon is for his suicide. There is a great deal more in the chart that indicates substance abuse and general instability, prompting my negative interpretation of the planetary combinations above. It would be a difficult time for anyone, and this young man had a painfully repressed chart. Notice, all this information and not a single sign or house indicated!